The county of Norfolk is known to be one of the UK’s most productive areas when it comes to agriculture, providing approximately 5% of the UK’s total farm output. As such, it really comes as no surprise that investors and industry professionals are hoping to capitalise on that with the construction of a new ‘food hub’ industrial estate near the small village of Easton. Local residents, however, have different ideas. The Defra-backed government initiative aims to create a ‘Food enterprise Zone’ on the 19-hectare site, which would allow food businesses to build on the land without going through the typical planning process. It is hoped that this will bring further business and investment into the county by upping the area’s share of the food processing market. Norfolk may be responsible for 5% of our nation’s food output, but that fact that this figure drops to 2.4% for food processing employment is an indicator that improvements can be made in terms of promoting local business. “If we can encourage food processing and value-added activities incorporating the latest technologies from our agri-tech sector, the nearby Norwich Research Park and beyond, I am convinced we can improve Norfolk’s contribution to feeding the nation,” landowner Ian Alston states. Broadland District Council has filed a Local Development Order (LDO) and is awaiting the input of local residents. Unfortunately for both the council and landowner Ian Alston, they don’t exactly seem keen on the idea. Residents have voiced numerous concerns in relation to the proposed development, with their chief complaints being the blighting of countryside views and substantial rise in traffic on the quiet country lanes, which are not exactly built with heavy traffic in mind. 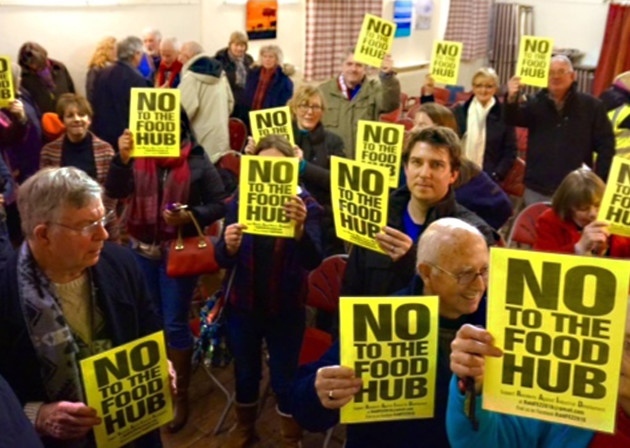 Campaign group Residents Against Industrial Development (RAID) has also commented on the ‘food hub’ plan, as they believe the term to be misleading. Despite these objections, those involved in the development seem undeterred. One avid supporter of the plan, Anglia Farmers’ chief executive Clarke Willis, stated that, “The importance of the Norfolk Food Hub cannot be underestimated and comments of local villages who do not always see the bigger picture is normal in such a visionary development. “There is no reason why Norfolk should not seek to promote food at the Easton location directly beside a major trunk road that is due to be upgraded in 2020.